There’s a way to report inappropriate levels, but it seems they persist. But does that really surprise anyone? Why doesn’t this comic have a blog? Whoa!! I have no idea! I’ll fix it. This is the first time since I’d updated my site that I’ve “scheduled” a comic and blog post, so something probably did indeed poop. I know a good anime ypu might enjoy: Case Closed, aka detective conan. It might look bad at first, but as it progress, it gets very good. Its been going for over 20 years, so there is plenty to watch (about 750 to 800 episodes), plus movie versions and more. Oh, a friend tried to recommend that one to me a while back, but I never gave it a try! Thanks, I’ll finally look it up! 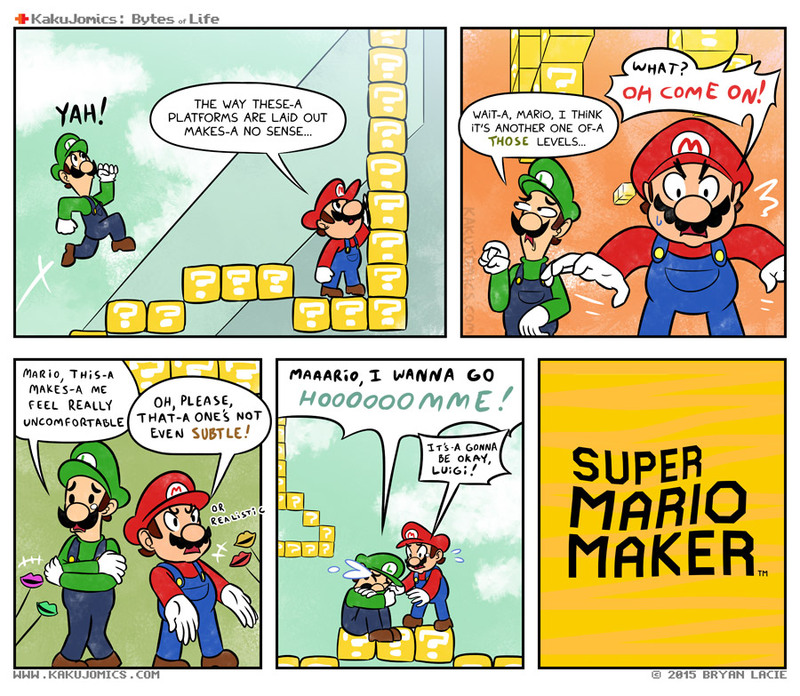 Aww, the way you draw Luigi is so adorable!